The Google Play store has long been the hub for sourcing and downloading the latest and greatest apps on to your Android device. But with other variants of the Play store now available for download, we're taking a look at one of the main contenders, the Amazon Appstore. Amazon already has a successful foothold in the Android market, with both the Kindle Fire and official Amazon app both doing well. The Appstore it has developed is similar to the Play store in a lot of ways, but includes a great number of features which may sway some people to jump ship. There's a huge collection of apps available for Android devices, and the Appstore does a good Job of filtering a lot of the junk you tend to come across on the Play store. One of the best features of the app is its ongoing App of the Day promotion, within which Amazon gives away one paid app for free. 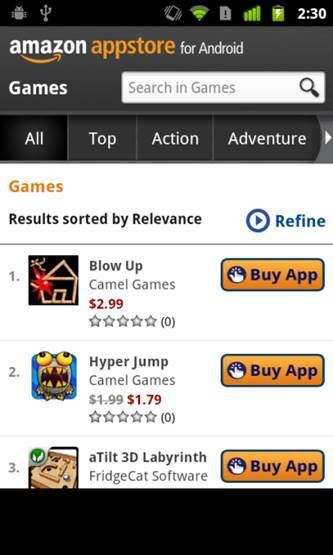 For this reason alone, you need to take a look at the Amazon Appstore. Here's how to get started with it. When you open up the app you’ll need to do one of two things. Either you’ll need to sign in to the store using your existing Amazon account details, or create an entirely new Amazon account from scratch. Once you’ve entered your details, press the Sign In button to continue. When you log in you’ll find the layout of this app store completely different to that of Google Play, so take your time to get used to it, Amazon give one paid app away each day which is listed on the homepage, so you might want to check to see which app it’s today. Find an app you want to download and open It. You’ll now find all the details relating to the app, including a series of screenshots and a thorough description of the app. At the top of the page you’ll also find the price and developer details of the app. If the app you’re purchasing requires payment, press on the Buy button to complete the transaction. If this is your first download, chances are you’ll get an error message asking you to add your payment, or an address. Follow the link provided and input your details. Instead of paying with a debit or credit card, you do have the option to pay with an Amazon.com Gift Card. Open up the Settings menu within the app, and select the Redeem Gift Card option. After inputting the details, your account will be credited with the corresponding amount of money. Once you’ve sorted out all your payment details, you’ll want to check out some of the most popular apps on the Appstore. The Best Sellers menu will list the most downloaded apps, as well as listing the best free apps on the Appstore. Download whichever ones you want! Due to the volume of apps on the Appstore, you might struggle trying to find any app you're specifically looking for. With a list of apps loaded, press on the Sort button. This will bring up a menu from which you can search for an app by its reviews, price and name. If you’re a game addict, or have children using your device, you may want to consider disabling in-app purchases. Open up the Settings menu from within the Appstore and select In-App Purchasing. Here you can select or deselect the ability to purchase In-App currency and items. To start setting up parental controls for when your child uses the Amazon Appstore, you’ll first need to open up the Options menu. On the bottom-right corner of the screen, with the Appstore open, select the Options icon. Select the Settings tab from the menu that appears at the bottom. There are plenty of settings and options listed that you can alter within this helpful menu, but the tab we’re looking for in this specific tutorial, is obviously the Parental Controls one. Scroll down three options on the list of choices until you find it, and open it. Now you’re ready to start setting some parameters. This screen will now allow you to enable the parental controls for the appstore, as well as create a secret PIN number. This PIN will be used as an alternative way of enforcing the controls, if your child knows your appstore password. Press on the Enable Parental Controls option to continue. After entering your Amazon password to confirm who you are, you will have free reign to set some parental controls for the application. Once you’ve set the ones you want to enforce straight away, press the confirm button. Then, before backing out of the menu, disable or enable the Use PIN option.